Finding the right glove can be a daunting task as there is a huge selection to choose from. Some players have their own brand they love and stick with no matter what, and then others don’t know where to start. I have compiled a list of the top 3 catcher mitts for youth players to help bring together the best to help players make a better decision on their purchase. What to look for in a youth catcher glove is different when shopping for an adult one – for example the price of the glove. When you’re an adult and buying a glove, the price ‘may’ matter but most catchers are looking for comfort and sustainability. This is because they already have grown and know their hand will not change making their purchase last a long time. For youths it is different. Their bodies are still growing and changing everyday which makes it hard to spend a lot of money on a catcher glove when a new one is needed next season due to growing. This is why the price should be a top variable when looking for a glove. Another factor of importance that would go along with price is the feel and fit of the mitt. Youth players can be picky on how their gloves feel and the initial moment they put the glove on can leave a big impression. This is especially the case if the glove comes broken in or not. Most youth players do not want to spend time to break in a glove and want to quickly to use it in the game right away. This is where buying a broken in glove would be the best option. The GXC105 glove is a great mitt at a great price for a youth catcher. It has some great features that take into account of a youth player such as the Power Close, V Flex Notch, and ParaShock technology. 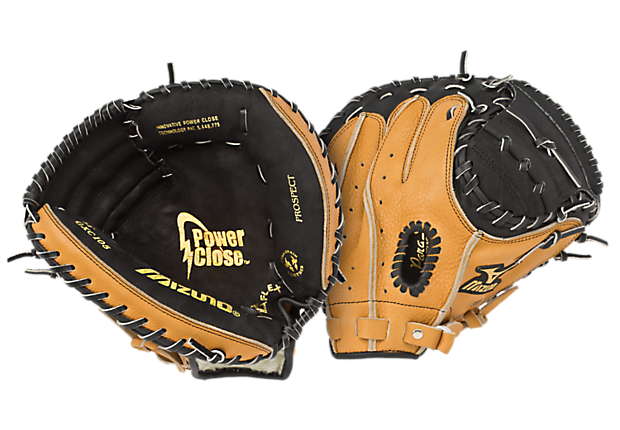 The Power Close and V Flex Notch both work together to help the catcher glove close with little strength. One of the top problems for youth catchers are them not being able to close the mitt all the way and keeping the ball inside the mitt after catching it. Catchers may get discouraged from repeatedly dropping pitching and soon give up on using the mitt or perhaps catching in all. ParaShock technology was created to absorb the shock of repeated use. This is very helpful as new and young catchers may have trouble catching pitches in the web of the pocket. Players will eventually learn how to catch pitches in the correct place, but when starting off young catchers have trouble doing so and this technology helps prevent injuries. The GX105 comes in with a size of 32.50”. If you would like a little smaller glove, you can find the GXC112 is the same glove but is one inch smaller coming in at 31.50”. Click here if you would like to view the GXC112. If you would like some more information on this mitt and see the current price, please click here. 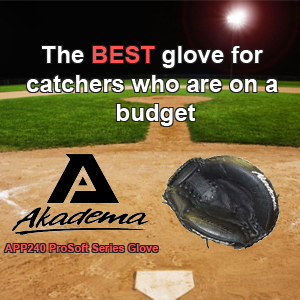 The next glove on the list is the AGC98 Prodigy Series from Akadema. 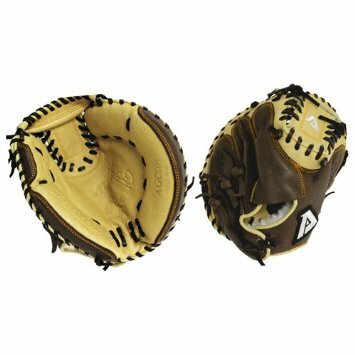 It offers similar qualities at the previously mentioned Mizuno glove such as: double-sided padding to help absorb shock , deep pocket to help keep the ball in the glove after catching, and also utilizes what Akadema calls the Praying Mantis. The Praying Mantis is a double flex hinge which makes the glove snap closed on contact. Many reviews states how well this glove helps youth catchers hold onto the pitches. The drawback of this glove is that it may take a little bit to break in. This does contradict what was said earlier about wanting a broken in glove, but the features and positive reviews (83% of reviews are five stars on Amazon) give it a mention as one of the top gloves for youth catchers. Some reviews do state that it was a quick break in process. The time will vary due to how much the glove is used. The final mitt on our list comes from Rawlings and will be the cheapest of the three mitts reviews (was at the time of writing this). It comes with full grade leather cushioned palm pads to help reduce the ball impact from receiving pitches. This is an important feature for a mitt to have for younger catchers. It is made from oil tanned full-grain leather which makes it very soft and comfortable for the player. Also features a 1-piece closed web which forms a deep pocket to help the catcher control and scoop the ball. Reviewers have stated repeatedly that the glove is soft and does not take much time (if at all) to be broken in. 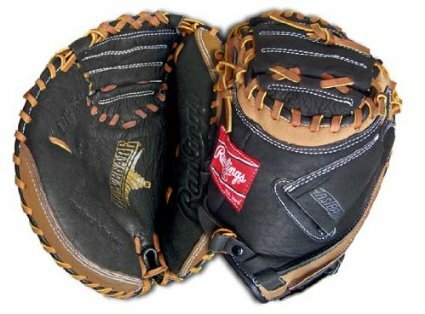 Out of the three mitts on the list, the Rawlings Renegade seems to be the best game ready mitt in terms of being broken in.